Having recently purchased a small trailer and put it on the Arroyo at the Arroyo City RV Park, I was eager to spend a night or two, and do some early fly fishing. Julie and I towed the Casita camper trailer to the Arroyo the previous weekend, but it was time to go through the launch routine and to do some fishing on my own. I went down on Saturday with Rosie and put the Stilt in the water before dark, so everything would be ready. It was great having a private launch, so I didn't have to hassle with the Park traffic. I set the alarm for 5:45, as I wanted to go out before daybreak and get some photos of the sunrise. Rosie was eager to go. It had been a while since I'd taken her with me, even though I got into taking her out with some of my clients last year. Having her along seemed to boost everyone's morale, and result in better results to boot. Even if that was a fantasy, she did seem to become a mascot of sorts, whose bouyant spirit kept the rest of us afloat when the fishing was tough. I had enough light to navigate into a back lagoon, where I could barely see reds blowing up and moving away as I approached the shallowest areas. On the way to my destination, I looked to my right and saw what appeared to be a school pushing water away from the boat's intrusion. While I could have stopped there, I made a mental note to check out the area later once the sun rose. I wanted to explore an even shallower area in the low light, where I would be able to see single cruising fish in the low light. They were definitely where I hoped they'd be. Shutting down in about 7-8 inches of water, I could see wakes pushing away in all directions. I spent some time letting them settle down, and started to hear blowups here and there. I knew the reds were feeding, so I opted for a Mother's Day fly and slipped overboard. It wasn't long, however, before I changed to a VIP popper, because the water was so shallow that as soon as the fly would hit the water, it would pick up grass or algae. The reds were showing themselves intermittently, but were still hard to track. 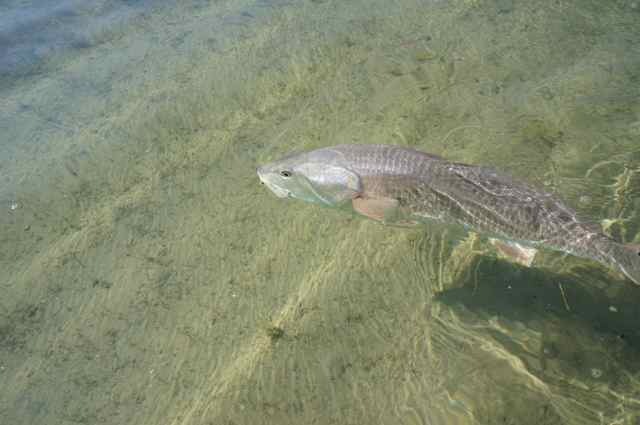 The wind was getting up, so the redfish movements blended with the waves and mullet action. Still, I was able to track a few of them in the shallowest areas, and cast the black VIP ahead of them. Wow, they were tough. I blew up one after another, sending small pods packing, and I wasn't sure if it was my presentation, or their mood. I tend to blame myself, but sometimes what is usually a virtue (taking responsibility) can obscure the truth of the matter. So, eventually, I opted to change my fly rather than to persist in the belief that my presentation was at fault. I shifted to a Kingfisher Spoon. I caught one 23-inch red, but after landing the red, the feeding action slowly diminished. I knew from hundreds of visits to this particular venue that the reds tend to migrate after the sun rises, and that the lack of action in one area may imply that they are gathering elsewhere. Sure enough, as the day brightened, I spotted reddish egrets, great egrets and a passel of Caspian terns working together near the area where I'd spotted that school earlier. Instead of making a quick run aboard the stilt, I opted for a more stealthy and time consuming approach. I told Rosie to get aboard the Stilt, and I pushed the skiff slowly in the direction of the melee. As I got closer, I could see reds coming out of the water, and pushing waves ahead of obvious feeding action. The birds were crazy with excitement. The egrets were running around behind the reds, and the terns were diving into the middle of the feeding fish. The reds were so intent on feeding that the birds didn't seem to bother them at all, even though the water was so shallow that the backs and tails broke the surface as they swept around side by side driving shrimp and finger mullet ahead of them. I wanted to video my catch, but I was alone. Having practiced one armed casting previously, in which I could shoot line and cast with one hand, I decided to take my new Sony and see what I could do juggling the two instruments. Since the reds were moving a lot, I figured I might be able to strip line into the water, and stay fairly stationery as they approached. As it turned out, I had no problem getting one shot after another. The first redfish surprised me by swimming by on my left. It was alone, and as it turned out it was near 30 inches long. I cast the spoon ahead of him a couple of times before he saw it, and then wham! He took it and ran. Holding the rod with one hand, I videoed his powerful run, in which he almost spooled me. It took a while to turn him and get him in, but the spoon fly rarely comes out once its found a purchase. I landed him, got a closeup of his massive body, and let him go. The best way to tell this story is through the video, which I have almost finished editing. Once I do I will post it on YouTube and add the link here. So watch for it. I showed my son Ryan the rough edit last night, and he got really excited. He's not easy to please, so I was particularly gratified with his response. How many reds did I land? Five more, from 26-30 inches. My arm was sore afterward, having supported the rod without any help. But I had fun getting some great video of big reds exploding on my fly. I think you will enjoy the result, even though it was hard to hold the camera steady. Next time, I will be better prepared, because I'm getting another video camera that I will mount to my cap--a "GoPro" camera. If you haven't seen the display for this camera in Best Buy, drop by and take a look. The promotional video is breathtaking. March is a transitional month, partaking of lingering cold fronts, but graced with warm breezes saturated in the perfume of huisache and citrus blossoms. For the novice fly fisher, the problem with March is not temperature, it is wind. Fly fishers lacking experience in the salt have a particular aversion to fishing on windy days; but traveling fly fishers do not have the luxury of planning around the weather and making plans on short notice. When your charter lands on a high wind day, guide and client just have to go out, regardless of the wind. This kind of compulsory attendance, while seeming like punishment, has forced me to discover that there are plenty of opportunities awaiting the fly fisher on a windy day in March. When you live near the water, and you're fishing for fun like I was last Monday, you might take your time getting to the water. The forecast called for clouds and breeze, so Julie and I decided to target the bay in the afternoon, when sometimes the clouds give way to the warming sun. After launching the Stilt, I headed for one of my favorite westside lagoons. Parker Lake is shallow by comparison to more popular westside venues, and thus most anglers avoid it in favor of deeper waters. 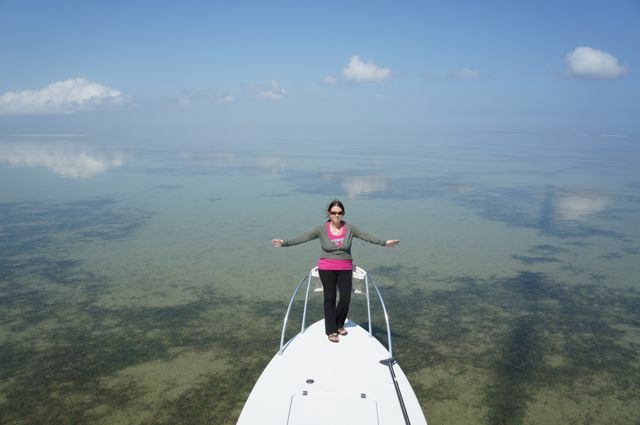 My boat was the only one in the four-square-mile back lagoon, and I ran back as far as I could before shutting down. On the way, huge single reds erupted and fled, leaving muddy trails as they fled in indignation. I was hoping for some pods, since the water was murky: I was afraid that I would not be able to see singles cruising steathily through the discolored water. But not encountering any groups, I eventually shut down before the decreasing depth made the decision for me. The prop dug into the mud as we came off plane, but I was sure that the Stilt could get us up again. I left Julie sunbathing, and went on a wade toward even shallower, but slightly clearer water where I might be able to spot cruising gamefish glowing in the afternoon sunlight. Alas, the reds weren't feeding in Parker as best I could determine. So I quickly returned to the boat and headed east onto the sand, directly east of the Arroyo's mouth. As we traveled across the increasingly clear and shallow water, the sea breeze came to a virtual halt. We passed beyond the edge of rippled water, and entered a glassy expanse in which the distant dunes of Padre Island sketched a white line over a horizon that was otherwise seamless in the surreal conditions. I was happy to see a few redfish moving ahead of the planing Skiff, so I shut down in gin-clear water, and gave the water and fish a chance to settle down. Leaving Julie behind, I took my TFO rod and Ross Vexis and waded barefoot eastward, keeping the declining sun over my left shoulder. After only 60 yards, I spotted three reds approaching head-down from the northeast. Since it was so calm, I opted to wait until I could cast about 10-12 feet to one side of the pod, knowing that even at that distance, the fish would perceive the presentation. Sure enough, one of the reds briefly turned toward the fly before resuming his course. I casted the fly a couple of feet closer, and saw the fish move together toward it. In seconds, they were chasing the fly side by side, obviously intent on winning the prize. Moments later, I hooked up on one and saw the other two reds take up a position behind the hooked fish and circle me for a while before heading away. After landing the 24-inch red and photographing it, I resumed my wade only to spot another, larger red within a few minutes. He was swimming quickly towards me so I false casted only a couple of times before shooting enough line to intercept him before he came close enough to spot me. He didn't hesitate to take the chartreuse Clouser, and I was fighting my second red within 15 minutes of leaving the boat. Obviously there were plenty of redfish on the sand, but I'd had enough. It was classic redfish action, but I put my rod away, rejoined Julie, and headed in.